It’s been a very hot summer and it’s expected to be a very cold winter. Imagine then if there were a cheaper, more reliable and greener way to cool or heat your home. Would you contact your local ClimateCare member and take advantage of it? Well, there’s no need to imagine because such products do exist. With geothermal heating and geothermal cooling systems from ClimateCare, you can use energy taken from the earth to dependably distribute heating and cooling in your home no matter what the climate. 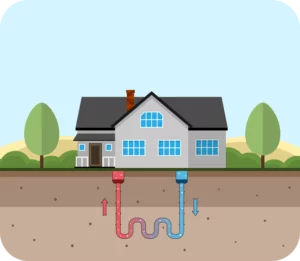 As mentioned earlier, geothermal technology takes energy from the ground underneath your home (or a nearby water source like a lake) to provide cool air in the summer and warm air in the winter. Now, how exactly is the heat found and transported? IN WINTER: A geothermal heat pump takes heat from one location (the warm earth) and transports it to another location (throughout your home). The further down you dig underground, the warmer it gets. Dig deep enough, and the underground temperature is about 15°C (give or take). And that warm air is everywhere. So it’s real easy to locate and extract. Underground pipes filled with heat-extracting fluid (yes, you read that right) are installed. Those pipes collect the heat and carry it towards a compressor. That compressor warms the air even further before it enters your home and the heat-extracting fluid goes back underground, ready to do it all over again. IN SUMMER: This process can be reversed. Warm air is taken out of your home and sent back into the ground. In fact, you can reduce electricity consumption by as much as 70% vs. conventional air conditioning. One of the pros of geothermal energy is its versatility. A single system does the same jobs as an air conditioner or furnace. And if you think geothermal energy is a bit complicated, chances are you’re already using it in your home. SAVE MONEY compared to oil, propane, electric or gas fireplaces (in winter) and ordinary air conditioning (in summer). GREATER ENERGY EFFICIENCY and lower greenhouse gas emissions; perfect if being environmentally friendly is important to you. ODOURLESS OPERATION around the house. IMPROVED SAFETY for your family because geothermal energy systems are non-flammable, with no need to store fuel. INVESTMENT PROTECTION since geothermal energy equipment is kept inside the house. There’s no need to worry about outdoor accidents, exposure to nature, or even vandalism. On a larger scale, as fossil fuel reserves decline and prices go up, it makes sense to use an environmentally-friendly solution that can use renewable resources. The upfront investment of installing a geothermal system soon pays for itself with the monthly savings in utility costs. The underground pipes used to ferry heat to-and-from your home are solidly built with a very long shelf life. Maintenance is much lower vs. traditional power sources and even unconventional ones such as solar and wind power. This is just the basics regarding geothermal energy and how it works. For more information concerning how a geothermal system can help heat and cool your house in an environmentally friendly and cost-effective manner, contact your nearest ClimateCare member. They’ll get back to you ASAP to answer all your questions and provide a FREE quote if you wish.